Two recent announcements reflect a steadily growing landscape of support for artists in Boston. Congratulations to the ten artists named as 2015 Brother Thomas Fellows – a list that includes four past Mass Cultural Council awardees. The Brother Thomas Fellows receive unrestricted grants of $15,000 through a fund established at the Boston Foundation in 2007 to honor the legacy of Brother Thomas Bezanson, a Benedictine monk and world-renowned ceramic artist. Last week, the Mayor’s Office of Arts and Culture and the Massachusetts College of Art and Design (MassArt) announced that 11 artists (including four past Mass Cultural Council awardees) were selected for the City of Boston’s first artist-in-residence program, Boston AIR. Funded in part by an Our Town grant from the National Endowment for the Arts, Boston AIR will allow the artists to “expand their own civic and social practice, alongside a group of liaisons from city agencies, including: Public Works, Property and Construction Management, Parks and Recreation, Veterans’ Services, Commission for Persons with Disabilities, Education, Policy, Neighborhood Development, Women’s Advancement, Elderly Commission, and the Boston Police Department.” The artists will work City liasons to co-design proposals to work with a city department. 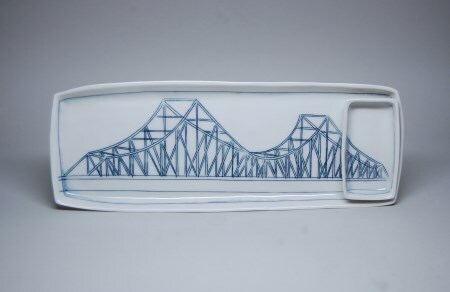 Image: Nicole Aquillano (2015 Brother Thomas Fellow), sushi set featuring Tobin Bridge.